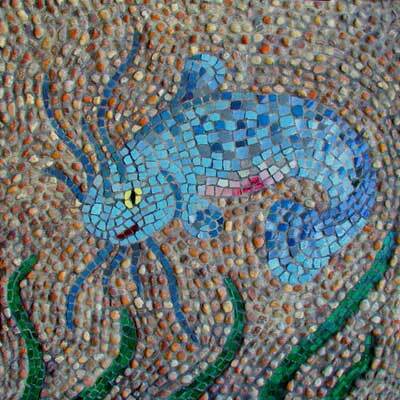 “Catfish” mosaic art. pebbles, stained glass, glazed ceramic, grout on panel. 24 in x 24 in. The catfish in this mosaic was made from broken shards of Archie Stapleton’s ceramics that we dug from the shard pile at the kiln while staying at the old cabin outside Sewanee. These Archie shards are a beautiful mix of blues ranging from slate blue to cerulean to light blue.